Lily's Ink Pad: Rose Cottage Birthday! Bubba's Grandma Blume turns 105 this weekend! Can you believe it? 105! WOW! We're having cake and ice cream with her at the nursing home she resides in. She has good days and bad, but remains in good health. She's a spitfire, too. I suppose that's how she's survived! One thing I learned, is that there is no top or bottom, and with no pre-planning, there is always a photo on its side! Next time, I'll use those visualization skills I preach and teach at school! 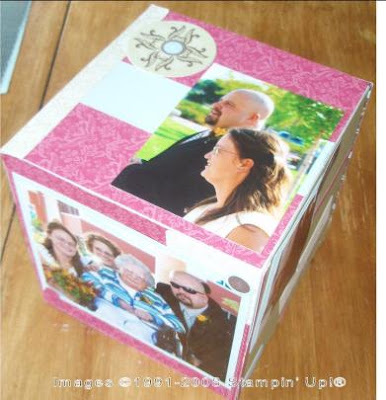 I did cheat a little, I found photo cubes on clearance recently. Basically, they were a large, white paper mache' cube. Cheap. Very cheap. I have directions on how to build my own, but this seemed way easier! 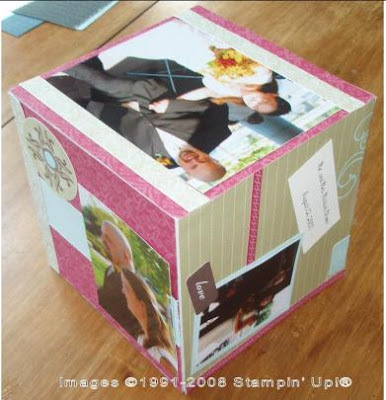 To make it even easier, I used a Simply Scrappin' Kit called Rose Cottage, which is sure to retire, as it uses Soft Sky and River Rock paper inside. I love the elegance, but not girly, aspect of this paper. Plus, our wedding photos look great when next to the colors: Real Red, Chocolate Chip, River Rock, and Soft Sky. 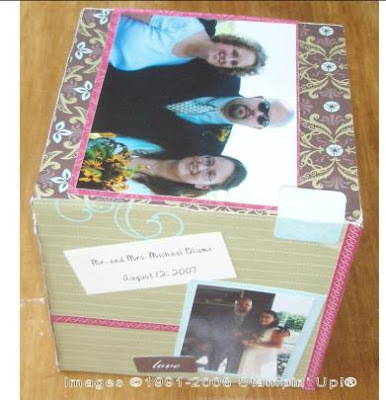 This is my fourth project out of this kit: 2 scrapbooks and one mini book have already used up parts of the paper. I still have plenty of paper, diecuts, and designer paper to do at least 2 more cubes! I see Christmas presents in my future! That cube is very cute, TFS! !